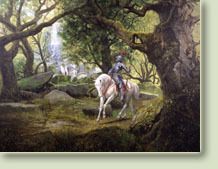 A knight errant rides through an ancient forest. Giclée Print published from an oil painting by Graham Turner. 'Fearing no Foe' is also available reproduced on good quality canvas, individually printed before being stretched on wooden stretcher bars - just like the original oil painting - and then varnished for protection. Note that canvas prints have no white border - this is the overall size of the canvas on its wooden stretcher bars and the image extends to the edge. Each canvas is individually signed (on the reverse, as there is no border) by the artist, Graham Turner. Canvas orders going to an overseas address should email us at info@studio88.co.uk for a shipping price - our usual shipping rates do not apply. "Took delivery of my canvas print yesterday and was totally gobsmacked, I can't stop looking at it. 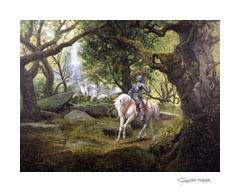 I love walking in forests they inspire my imagination, if only I had half the talent of Graham to paint or draw my inspirations."